Something is wrong with Carlie. 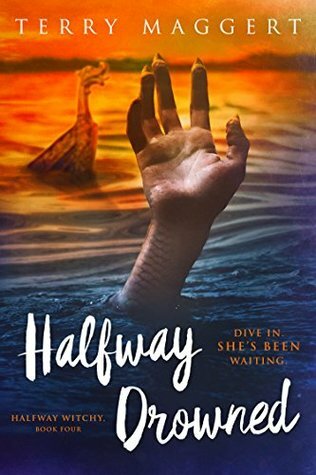 The fourth installment in the Halfway Witchy series doesn’t disappoint – Carlie is as quirky as ever but this time she’s travelling a darker path which switches the whole series up a gear. She has to deal with the consequences of her actions from the last book and there’s no guarantee that she’ll get out of it unscathed. My favourite part of this book, apart from Carlie’s rants about food and being short (I can relate. I’m 5’2″ and worship at the altar of baked goods), is the good old fashioned sea monster. When an old Viking dragon ship is washed up after a storm, ancient bones are discovered and some of the local wildlife start being picked off – something has woken up hungry (also me). In a world where paranormal fiction is mostly vampires and shapeshifters, I like me a sea monster here and there! This book was a fun reintroduction to all of the characters from the previous books, as well as an introduction to a new one who will probably be cropping up again in the future. The dynamics between all these characters change over time and I love reading about it – especially how Carlie matures in her relationship with Anna, her boyfriend’s ex and mother of his child. She’s starting to understand that she has to grow up a bit and make concessions to keep things running smoothly – which doesn’t really come naturally to the average 22 year old. My only issue with this book is that quite a few things were left unexplained or have a quick throwaway solution rather than getting in to it, this all happens quite late in the book so you have to just accept that this is the way things are (I don’t think I was skimming, so I don’t think I missed anything). Normally, this would bug the crap out of me but for me this series is all about Carlie and her internal monologue, so I’ll let pretty much anything slide just to listen to her gripe about things. Finally, can I say how gorgeous the covers are for this series? They keep getting better and better! For some reason your twitter handle seems to have vanished when I want to tweet your post. Gremlins? Must be! I’ll have a prod at the computer when I get home 😄 thanks for letting me know and for trying to share! Recently released – it’s brilliant! !